Are human beings the only animals that weep? Charles Darwin noted that Indian elephants weep. There have been many books written on the subject of animals’ emotions, and I haven’t read any of them, so I’m not going to venture an answer. What I do know is that I weep. And Steve weeps. When we weep — not cry, but weep — it seems to come from a sacred place in our soul, a place that has been stirred by something far greater than our selves. Of course, we can make efforts to wall off that place, if we want to. Bombarding ourselves with distractions often works to activate those shields. We can also choose to be curious and try to understand that feeling better. Tears can be a sign of “religious experience”, then. Fair enough. Something spiritual is going on there. What? That loneliness, that “pocket of silence where we can root and grow” resonates deeply with my partner, Steve. He calls it being moody or refers to his “Slavic melancholy”. 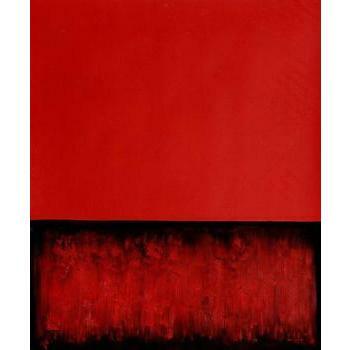 It’s not a sorrowful thing only; it is just as brightly tinted with joy, like some of Rothko’s paintings. The combination, the totality is what hits home with him. He says, “The deeper story is to face all of life. Jesus and the Buddha are heroes of that story.” They are not conquering wartime heroes interested solely in winning. They do not struggle and strive. They embrace all dimensions of life equally: the suffering, the love, the sacrifice, the elation. Steve weeps when listening to Mahler. And “Puff the Magic Dragon”. Slipping into his cave, searching for that place to root and grow, he feels the poignant essence of life, the crescendo and decrescendo, and resists exerting his will against the flow. I think that I have a different sensibility. Maybe not so expansive, maybe more interior and visceral. I identify with a lonely pocket of silence for rooting and growing…the womb. I feel womb-love, the ache, the swoon, the exchange of life blood. I see colors inside my eyelids, sunshine through membrane, the tragedy and ecstasy and doom of flesh. Okay, I am in the grip of my biology this week, so this makes a lot of sense. I have given birth four times and dream of my grown up children regularly. The story that trips my tear ducts is “Homeward Bound”, anything with a reunion. The deeper story for me has something to do with connection. Maybe that’s the Gaia story. I think she’s like Jesus and Buddha in that she also embraces all of life without struggling or striving, but in her own way. Perhaps I feel more in my Sacral Chakra, Steve in his Heart Chakra. The deeper story of being human is told from inside this skin. It is not the only story in the universe, however. There is the elephant’s story, the asteroid’s story, more stories than we can imagine. I would hope to know many more, and to weep at all of them. This entry was posted in Awareness, Buddhist, Christian, Mysticism, Philosophy, Psychology, The Arts, Uncategorized and tagged art, emotion, Joseph Campbell, music, myth, Rothko. Bookmark the permalink. and hopefully to smile at a few too? Oh, I often smile while I weep! Oh, God, you mean with my nose all red at the tip and my eyes all puffy? I think I’ll spare you…. Elephants weep, but did you know that rats laugh? They giggle at a pitch too high for us to hear and they tickle each other. Rats Laugh…my imagine is working overtime visualising that one! thank you for that tidbit — it made my day! I loved your use of the word “womb” as a verb in a previous post. There is powerful, life-giving truth to that story. Your description of Steve’s experience sounds more of an intuitive, third-eye observing sensibility. Where you both interact is the heart chakra, for that is the center that puts love into action. Think of hands as its natural extensions. It is also a place in the body that bears the load of personal emotional history. You would not be able to tolerate being with each other in an intimate relationship if you were not equally open to feeling on that level.